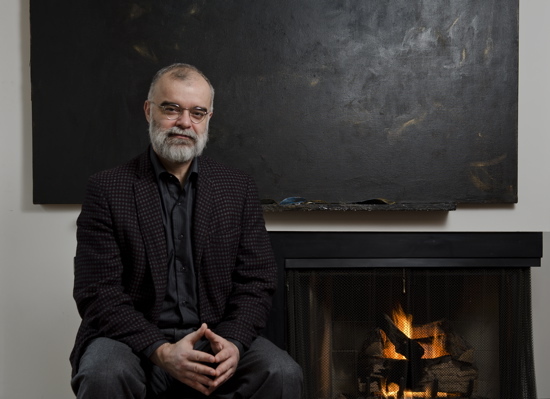 Rodney Sharman is a prominent Vancouver composer whose career goes back to 1980. I met with him in his home in Vancouver, on Febrary 24, 2015. He was affable and talkative, and the conversation wandered among topics such as his experiences as a student, Mozart’s early childhood scores, and his one time teacher Morton Feldman’s table, given to him by Feldman’s widow and displayed proudly in his living room. Here we discuss his perspective on the composing process, current artistic trends in new music, and his thoughts on the Vancouver new music scene. Where do you find the seeds or initial ideas for new pieces? What’s the very first step in your composing process? It varies from piece to piece. Usually it begins with the acoustical properties and technical properties of the instruments themselves. In fact, this happened to me twice this fall, because I was writing for instruments with which I had no experience. I wrote a little fragment for the oud. I was writing for the oud for the first time, and really immersing myself as much as possible in its tuning and so on, and came to write a piece that was about its acoustical properties. It was my friend Cathy Lewis’ birthday this year, and I wanted to give her a song, a surprise. Her friend Doug Hensley had asked me to write a piece for guitar and voice. But Doug is probably the best lutenist in British Columbia, so I wrote a lute song. I had never written for lute before, and it was an extremely inspiring experience, and the piece is at times heterophonic, so it required me to really understand the fingerings. So the ideas came from the technical aspects of the instrument itself. I think you can even hear this in my piano music, my harp music, my violin music, and so on. If you look at probably any of my scores, you will see that the ideas are coming from the acoustical properties and the technical properties of the instruments themselves. There’s another way in which I come to music, particularly in piano music, and that is that I write music about music, music about the transformation of music. I’ve written nine opera transcriptions in which I’ve taken opera arias and duets and rewritten them for the piano. My very first one involved writing this musical graffiti over the top of it. When it came to writing a piece for my friend Tony de Mare, who asked me to do something, I took his very favourite opera aria, which was “Nessun Dorma,” and I put the whole thing, the recitative, the aria, exactly note for note. I moved the rhythms just a bit, I think three times, but I drew all this musical graffiti over the top of it. You hardly hear “Nessun Dorma” at all. So those are my main two approaches to instrumental music. [In the case of] vocal music, it’s mostly in service of drama, and of the words. In the case of my music for theatre, my chamber operas and the music-dance-theatre piece I wrote recently called From the House of Mirth, based on Edith Wharton, where communication of the words and storytelling are at the centre. I have written some vocal music which is about timbre, and about register, but those pieces tend to be choral pieces. You’ve said before that you think the current trend toward program music is unfortunate. Why? It surprises me that in concert after concert that I attend – I’m very passionate about the work of my younger colleagues, and I go to a lot of concerts – some of the greatest and most inventive, creative minds, particularly in Canada and the United States, write stories. When they speak about their music, they speak about it in terms of stories and narrative and portraying emotions. Glenn Gould said that Richard Strauss was the most important composer of the twentieth century. And with every piece that’s written by a young composer who does this, we are proving that Glenn Gould was right. We’ve just celebrated the second New Music Festival at the Vancouver Symphony, and Kelly Marie Murphy had a violin concerto, which many of my colleagues admire tremendously. I was bewildered by her comments when she was asked, how did she come to write the piece. She talked about the psychopath who lived next door. She [talked about how she did] research into sociopathy and psychopathy. She doesn’t talk about going to her friend, the violinist, and finding out what sounds good. She doesn’t talk about [wanting to] particularly emphasize this aspect of violin timbre, or playing, or whatever. She talked specifically about the storytelling aspect of the piece. Right. So do you feel that that sort of approach is like translating a story into a medium that’s fundamentally not about storytelling? That’s beautifully expressed, but those are your words. That’s a bit of a leading question. [Laughs] No no, that’s an excellent question, and you’ve put it beautifully. I am suspicious of making a piece based on extra-musical elements, in piece after piece. Yes – do it. As classical as I am in my sensibilities, I’ve written one explicitly programmatic piece. And I work in the theatre too, where the setting of an atmosphere is everything, and where timing, and (if there’s a narrative) storytelling is extremely important. But as a constant presence in concert music…I was composer in residence of three different orchestras, and one of the things that has happened in my life, and I was part of making it happen, is that artists now speak from the stage and talk about their work. And it is very difficult to speak about musical things. I always did and I always do. But it’s much more easy to speak to a non-specialist audience and tell them that it’s about a story, tell them that it’s about the murderer who lives next door, tell them that it’s about your trip to India. I am very fond of Jared Miller and his music, but he wrote a piano piece that was about three of the places he visited on his European summer vacation. He wrote a string quartet about his grandparents’ Alzheimer’s, which I know was extremely difficult for him, and emotional, but it was still music about some kind of extra-musical source. I look forward to hearing a piece by Jared that does not do that. I look forward to hearing a piece [like that] by Gabriel Dharmoo, who I think highly of as a composer, but in Gabriel’s music, every piece of his I’ve heard has portrayed some kind of narrative or picture, and I wonder why. Now, this may be simply that I am like a composer from another generation who cannot fully appreciate the artistic compulsions of my younger colleagues. But I do teach in Europe, and I go to concerts of younger composers in Europe, and I can assure you that when I hear the music of marvellously gifted people in Munich and Lübeck and Amsterdam, they are, on the whole, writing abstract pieces that don’t have anything to do with the conveying of a narrative – not at all. When I was in Lübeck, I heard a piece by a young man that was for two double basses and two cellos, and it was dense and it was difficult and it was absolutely marvellous. You could compare it to the music of Scelsi, you could compare it a little bit to some aspects of Xenakis, but it was so personal. And I’m thinking, this is fantastic. How is he going to end something in which there is no trajectory, where the music is like listening to scribbling (marvelous scribbling, but constantly dense). The music stops, the players take their mutes off, and suddenly you’re hearing the music with this kind of three-dimensionality that was hithertofore not present because of the mutes that you didn’t even notice were there, because the music was so dense and so loud. It’s those sorts of ideas that are worth stealing. When I go to a concert of music by young composers, I want to hear something that I couldn’t have thought of myself. I want to hear something that hasn’t been thought of by someone else in another time. I want to be excited by something that I’ve never heard before. Do you think that this current trend toward program music is any way consciously a throwback to the program music of the nineteenth century? I would love to say yes. I would be so happy if it was consciously a throwback to the nineteenth century. Sometimes I’m afraid that it’s done thinking that this is the only way that music can be written. That’s a terrible answer to a terrible question. I’m not sure that I want people to know that I have this dark thought. But sometimes I think that this storytelling, that this narrative aspect of music is done without thinking of its nineteenth century models. How do feel about the current Vancouver new music scene? Do you think Vancouver, BC, or Canada in general has a unique musical identity? I was on a national jury a few years ago where a brilliant colleague from eastern Canada, who had lived in western Canada for a while, went on a rant speaking about the west coast and the “cult of beauty.” And then he pointed across the table to me and said, “…And you are part of the problem! You are one of them!” So yes, I think that, if we go up the entire coast from California to Alaska, we are shamelessly involved in this cult of beauty, particularly harmonically. Composers in Victoria…The tradition there is a little bit different and perhaps more related to what happens at CalArts, where old instruments, new playing techniques, and old technology come together to form new things. But I would say that my colleague Eldridge Priest is right, that the west coast luxuriates in the cult of beauty. Do you think this is not true of, say, Montreal? Oh, this is a west coast phenomenon, absolutely. Our music can be distinguished from music of other geographical areas, and [by our music] I do really mean California to Alaska. Do you think there’s a division between French and Anglo Canada in terms of music? I would say that music in Quebec is more insular than music in other parts of the country, and that [composers who are working there] tend to influence each other more than composers in other parts of Canada are influenced by [other composers] in the same proximity. I would say that, for better or for worse, composers from the rest of Canada tend to look a little bit more outside.